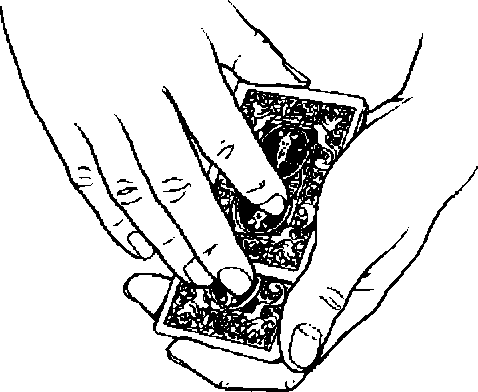 K$> In tricks like The Dunbury Delusion, the whole audience knows that you've got the wrong card (and that you've discarded the right card). In this effect, only the spectator knows which card he is thinking ol. This has an upside and a downside. The upside is that it adds a lot oi credibility to the apparent miss. It's easy to believe you might fail if you're trying to identify a card whose identity is locked in one spectator's mind. That's also the reason, as you'll note in the script, that I engage in a bit more by-play on this card, to make it more memorable. Also, when the spectator names his card at the end, I always glance down at the table in surprise. This will hopefully trigger the audience's memory about the card having already been dealt. You don't have to use these specific techniques, of course. But you should do something to draw enough attention to that card that the audience will realize at the end that you already dealt it on the table. & 1 assumed in the explanation that all the assisting spectators were male. In fact, using at least one female spectator provides additional scope for humor. I'll leave it to you to as to how to develop this.